Tonight, I finally went to the Fifth Floor lounge to try the Fifth Floor burger! The burger itself has been on my list of burgers to try, as it has been on a bunch of top burger lists. And it comes with comte cheese, one of my absolute favorite cheeses. 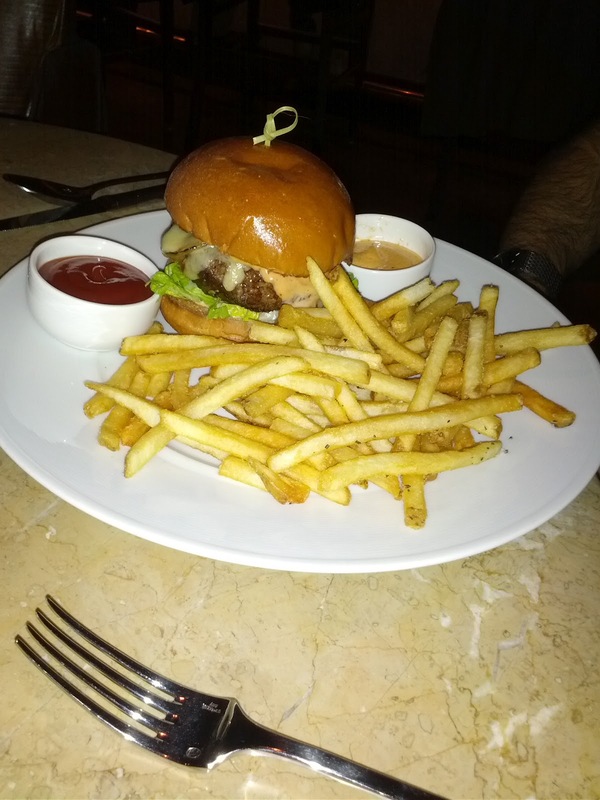 The burger is served only in the lounge area, where you can also order anything a la carte off the restaurant's main menu (including the dessert menu!). I really enjoy this style of dining, where I don't need reservations, can be dressed more casually, feel more relaxed, but still get to enjoy high quality ingredients and cooking skill. There was a dish on the tasting menu that I really wanted to try out, so I asked about getting that a la carte, and was told that normally they would let me, but that tonight they were worried about running out of it for the regular tasting menu, so they couldn't do it. I really, really enjoyed a dessert their pastry chef demoed a few weeks ago, so I've been wanting to try out more of his desserts, after not being impressed with the ones I had when I went in for a full dinner a few weeks ago. And ... the dessert menu has a crème brûlée on it, which, if you've been reading this blog at all, you know I've been on a major crème brûlée crawl these days. The Fifth Floor has just been on my radar a lot lately, as the chefs are showing up all over town! I've been to cooking demos by chefs Francis Ang, David Bazirgan, and Nicoali Lipscomb all in the past month or so. They were also at the Taste of the Nation event a couple weeks ago, and Chef Baz was one of the guest chefs at the last Alexander's Steakhouse special foie gras dinners. The lounge is an awesome space. Beautifully decorated, comfortable chairs, a variety of seating options, including bar seating, seating with small tables just for drinks, and seating with full tables for dinner. It was elegant yet not stuffy in any way, fancy yet casual, spacious, lively yet not too loud, just really a quite nice atmosphere. The service was great. Just the right amount of attention, all of our needs met, friendly. Plates cleared promptly, share plates and new utensils brought quickly, etc. The waitress knew the menu inside and out, and could describe every element of every plate (which is impressive, given how many things were going on in these dishes, and the fact that they do change up their menu fairly frequently). The amuse bouche came out quickly, but the other food took a rather long time. I had somewhat started to wonder if they'd somehow lost our order. The waitress did make several comments about how busy the kitchen was that evening, so I think that is probably why things were slow. The absolute highlight of the evening came at the end, after we'd paid our bill. I saw a group up at the bar get a dish that looked fascinating: there was a shot glass, a tiny little cotton candy, and a spoon of something. Intrigued, I asked the waitress what it was. She said it was the intermezzo dish for the tasting menu, and then went on to describe it. I heard phrases like "foie gras and amaretto ice cream lollipop", "walnut cotton candy", "strawberry sphere", "muscatel granita". ZOMG. If you know me at all, you know she just described a slew of my favorite things. And I'd failed to convince my fellow diners to have the foie gras for an appetizer, so I was without foie gras for the day! My eyes must have gone wide as I took this all in. And she saw it. "You want one?" she offered. And a few minutes later, we each had a tiny little platter of amazingness in front of us. Amuse bouche: Chicken liver mousse, milk jam, pickled green garlic, pine nut crumble, toasted brioche. This was a tasty little bite. The brioche was very crispy and had a great crunch to it. The mousse was creamy and had a decently strong liver flavor to it. The other components weren't really distinguishable, but added interesting textures. I enjoyed this, particularly for the liver mousse. I've been on such a liver kick lately (obviously foie gras, but I've also been getting into chicken liver lately), and I was a little sad that I wasn't going to have any today. Yay! I appreciate that the lounge serves an amuse, even if you aren't doing a multi-course dinner. Little surprise touches like this really make the experience more complete. Slow Cooked Egg : jamon iberico, asparagus, black truffle. $14. This was a second course from the regular menu. Ah, slow cooked eggs. The egg was, as expected, perfectly cooked. I know that this is just a science at this point, but it still continues to impress me whenever I get one of these eggs somewhere. It really makes me want to get my own souz vide setup, as it seems like I could easily have an egg like this whenever I wanted! I'm not really a fan of ham, so it was sorta lost on me, although I did appreciate and acknowledge the strong flavor to it. The asparagus was in the form of the puree. It was ok, but I would have preferred a stronger asparagus flavor. The truffle came two ways: in the foam and in a few shavings on top. Unfortunately, I didn't really taste it at all. Overall, not the most successful dish for me due to mostly personal preference, but the egg was perfection, and I did really like the creaminess and lightness of the asparagus puree mixed with the luxuriousness and richness from egg yolk that just barely ran out into the puree when you cut open the egg. Ok value for $14. I could see this working on a brunch menu too. Fifth Floor Burger: Firebrand bun, comte cheese, bourbon onions, sweet pickles, fries, aioli. $16 (or $25 paired with a beer and a bourbon). And ... the reason we came - the burger! The bun was a nicely toasted, slightly sweet, brioche. Soft, fluffy, slightly glazed on the outside, good grill level inside. Held up well to the burger. Definitely a good bun. Toppings were a sizable but not overwhelming chunk of crispy lettuce, a generous number of sweet pickles, the onions, aioli, and of course, the awesome comte cheese. I love this cheese and it worked quite well on the burger, very nicely melted. I was disappointed by the onions, there weren't many, and they weren't very flavorful. The amount of aioli was a little much, and since it came with a pot of it on the side, I would have preferred to be able to just put on how much I wanted. But overall, these were good toppings, providing a multitude of flavors and textures. The patty itself is made from ground short rib, chuck, and skirt steak. Quite frankly, I was expecting much more from it, flavor-wise. It was clearly quality meat, don't get me wrong, but I expected to really, really taste something special in the mixture, and I didn't. It was very however very moist and juicy. Cooked to a pretty nice medium rare, although the outside was a little more cooked than I'd have liked, and also didn't have much of a crust on it. Overall, certainly a solid burger, with well thought out default toppings, but it is nothing compared to the one at Alexander's. 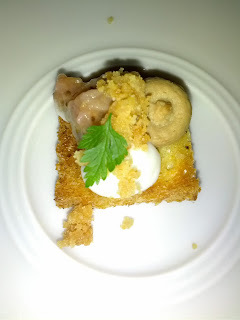 I need to get back to Spruce again sometime soon for a comparison (and, for their insanely good foie gras and waffles dish! ), but I think I preferred Spruce's version as well. The fries were decent, thin, crispy, salty, but pretty standard and not particularly memorable. The aioli was pretty good, it had a smokiness to it that reminded me of bacon, although I don't think there was bacon in there. It also had a spicy kick to it. Price seemed about right for this quality of burger in this setting. 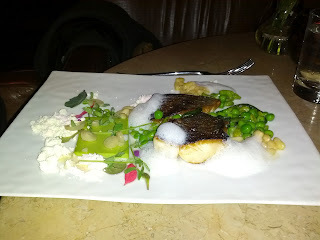 Black Cod: peas, favas, ramps, geeen garlic, powdered vinaigrette. $34. Entree from the regular dining menu. Foam, powder, puree, oh my! 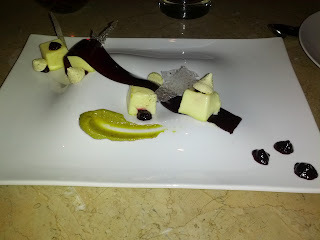 I didn't have this dish, but did try the green garlic puree, which was formed into a square, and reminded me of a savory panna cotta. It was creamy and had a really strong green garlic flavor. I really liked it. Orange Crème Brûlée: cassis veil, pistachio meringue, long pepper glass, pistachio puree, cassis jam. $12. I knew this would be a play on a crème brûlée, but I wasn't exactly expecting it to be such a play on it. On the plate were four cubes of the orange custard. It reminded me more of a panna cotta than a crème brûlée as it was fairly firm (and, not brûléed). The orange flavor in here was fairly subtle, which was fine with me, as I'm kinda sick of citrus flavors. It was kinda creamy, but in this form factor I felt I didn't really get to enjoy it much. I guess part of the appeal of a crème brûlée or any pudding/custard type dessert is sticking my spoon into it and getting big spoonfuls, and you couldn't do that here. The cassis veil was jelly-like and had a decent flavor, but I wasn't really that into it. The cassis jam was intensely flavorful and delicious, and I did enjoy spreading some of that onto my bites of the custard. The standard crème brûlée crust was simulated via the long pepper "glass" on the plate. This stuff was crazy. I'm not sure what the base was, as it wasn't very sweet. But it was intensely peppery. The flavor didn't really work for me, but the texture was great, giving the crunch I wanted on my crème brûlée. 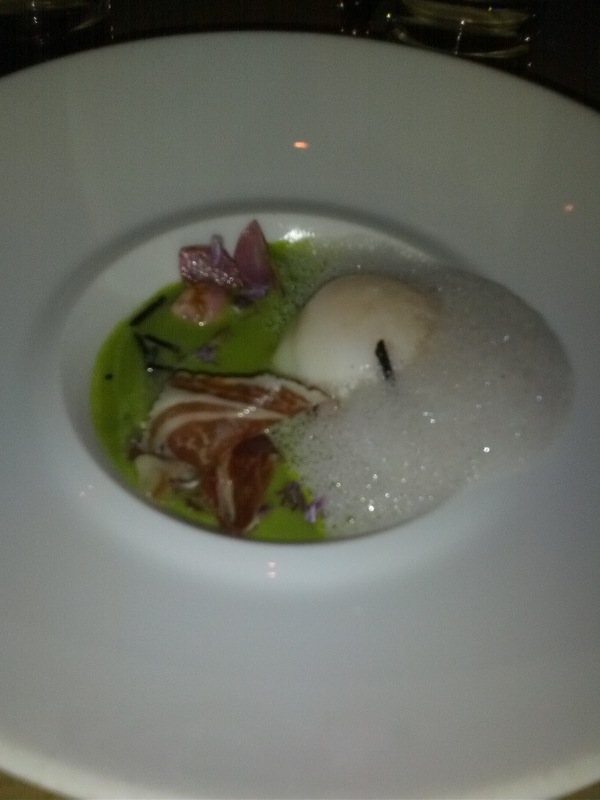 The pistachio puree had a very strong pistachio flavor and was nice and creamy. I really enjoyed a spoonful of the pistachio puree with the cassis jam. Sorta like peanut butter and jelly! But, I failed to see how it really paired with the rest of the dish. The pistachio meringues were again insanely flavorful, just bursting with pistachio flavor, and a delightful mix of sweet and salty. They also added a nice crunch to the dish. Overall, this was ... just strange. I appreciated the contrasts of textures (creamy, crispy, crunchy), the strong, unique flavors (citrus, cassis, pepper, pistachio, sweet, salty, spicy) ... but it was kinda just weird. And although the plating was elaborate, it wasn't very pretty, nor functional. Still, it was a fun play on a crème brûlée and I'm glad I tried it out. 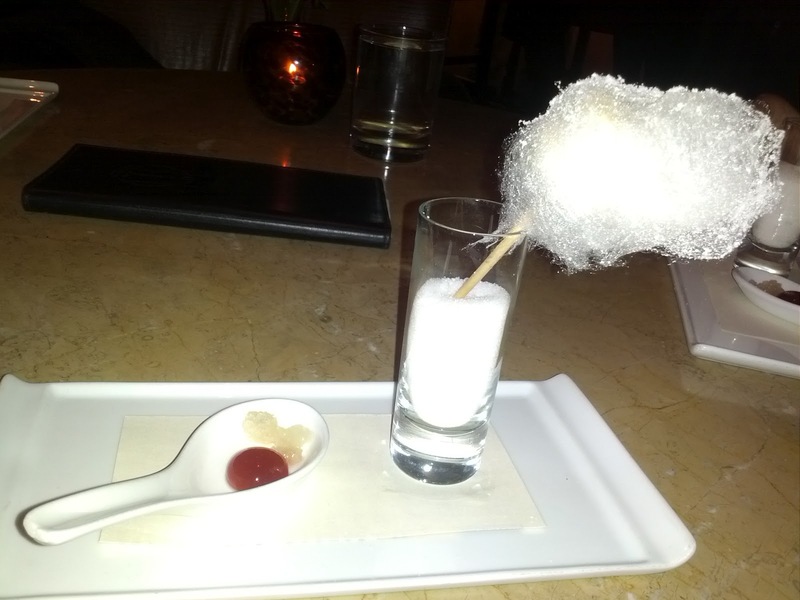 Foie gras and amaretto ice cream and walnut cotton candy lollipop, with muscatel granita and a strawberry sphere. OMG. Amazing ingredients and preparations. Awesometastic. In the spoon was a strawberry sphere. These things are all the rage these days! I keep having spheres everywhere! This one was intensely flavorful. It was also just really well made, with a skin that burst easily once you put it in your mouth. Absolutely delicious. Also on the spoon was the mustcatel granita. Cold, icy, and again, intensely flavorful. They really manage to infuse some serious flavor into things here. But the star was in the shot glass. It held what looked like just a mini cotton candy, but inside the cotton candy was the foie gras ice cream! The cotton candy was walnut flavored, sweet, and just kinda fun. The foie gras ice cream was creamy, had a strong foie flavor, and was just downright amazing. I didn't really taste the amaretto. I loved basically everything going on here. Very intense flavors. Tons of different textures and temperatures. Fun and whimsical. So creative.